Offida, an ancient village enclosed by the 15th century castle walls, is located among the most beautiful villages in Italy. Located on a rocky outcrop, between the valleys of the Tesino and the Tronto, it is known for the laborious and patient art of delicate bobbin lace, an ancient tradition, to which a museum is dedicated. The vast panoramic square at the entrance of the ancient core houses the remains of the fifteenth century Rocca, at whose feet stands the Monument to Merlettaie. The production of bobbin lace is still very widespread: it is not rare, strolling through the historical center, to see in the half-light of the halls of the ladies' houses intent on working with small wooden spindles. The museum of bobbin lace (which has a special path for blind people), is located inside the nineteenth-century Palazzo De Castellotti - Pagnanelli which, since 1998, also houses the archaeological museum "G. Allevi ", the Popular Traditions and the Municipal Art Gallery and thus constitutes a real cultural hub. The heart of the village is Piazza del Popolo, with its unusual triangular shape, overlooked by different buildings in terms of style and material. On the main side you can admire the Palazzo Comunale, with an elegant loggia of thirteen columns in travertine and a XV century portico. formed by brick columns with travertine capitals. From the portico of the town hall you can access the splendid Teatro del Serpente Aureo, built in the 19th century, rich in stuccos and gilded carvings. On the same square there is also the eighteenth-century Church of the Collegiata, which has a composite style facade and the Church of the Sorrowful, where the Bara of the Dead Christ is kept. The Church of S. Agostino is located in the distance, with the annexed Chapel of the Eucharistic Miracle. The most important building of worship is located at the edge of the village, on a cliff with steep walls: it is the Church of Santa Maria della Rocca, an imposing Romanesque-gothic terracotta architecture, built in 1330 on a pre-existing Lombard church; inside you can admire the beautiful frescoes of the Master of Offida from the 14th century. 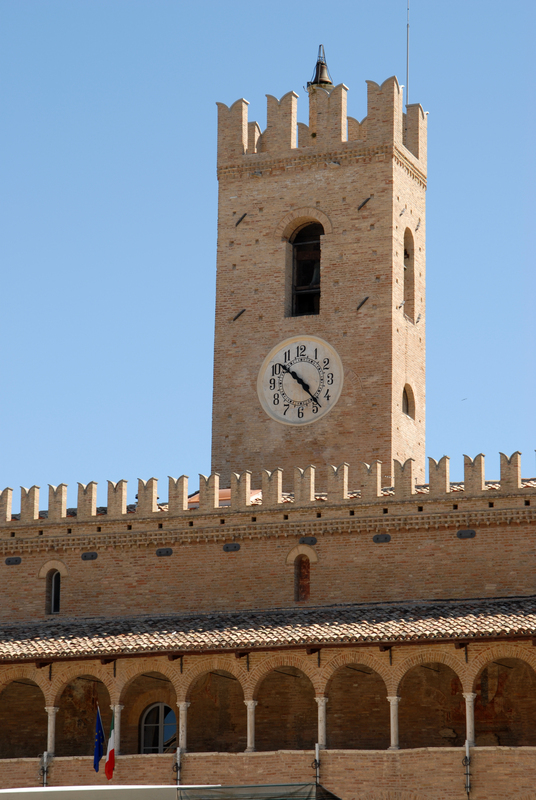 The former monastery of San Francesco, in the historic center of Offida, houses the regional wine bar that offers a complete overview of the enological production of the Piceno and Marche regions. 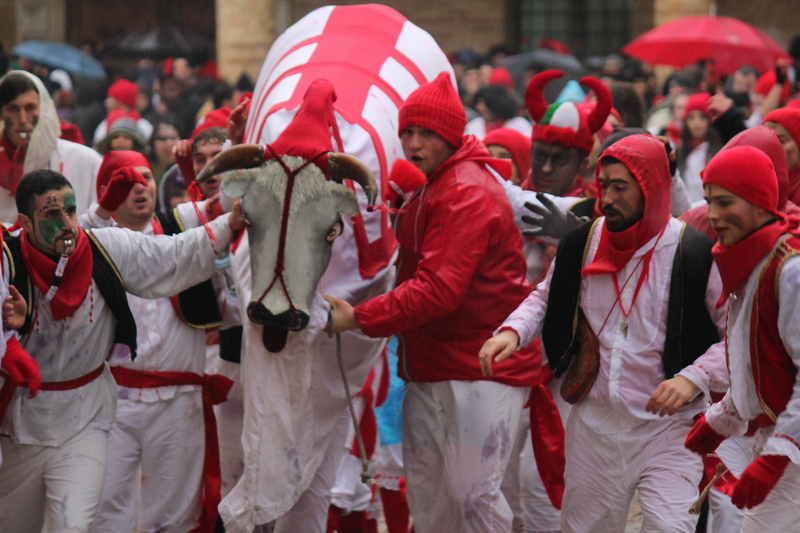 Among the most significant events taking place in Offida during the year we mention: the historic Carnival of Offida (January, February), Offida Opera Festival (September) and Di Vino in Vino (September). The local food and wine excellences are: the stuffed chichì (a focaccia with tuna, anchovies, capers and peppers), to which a festival is dedicated, "funghetti" (anise-based sweets) and Terre di Offida DOC and Offida DOCG wines.